We got up bright and early on a Saturday morning to head to Eagan High School for our first tournament of the 2015-2016 RES-Q season. The night before, we had put the finishing touches on Stacy, printed the last of the engineering notebook, and packed up for the next morning. We were all feeling a lot less stressed than at this time last year. After all, we could only do our best – even if it wasn’t enough to advance to the state competition, we still had a second chance at our qualifier in January. Little did we know just how the day would turn out. The first thing we did when we arrived was set up home base. Our pit was looking pretty snazzy with a tri-fold poster that Amy and Amelie had finished the night before. We were placed directly next to our friends the Motorbolts and EPIC, which made it easy to stop and chat about how our days were going. Our first event of the day was a Field Inspection, in which we practiced running our robot on the field to make sure all of the electronics and connections were working. In contrast to the coming matches, everything ran smoothly and we were able to pass the inspection with plenty of time before our next event, the Judge’s Interview. The Judge’s Interview is a team judging session in which the team give 2-3 judges an overview of their entire season in 15 minutes. Our method is to have a 10-ish minute presentation, leaving 5 minutes for questions and to add anything in that we may have forgotten. Everything during the 15 minutes went as planned. We had a lot of fun joking with the judges, making it seem more like a friendly chat than a judging session. After running past the 15 minute limit, the judges said they would visit us later to talk more. We came out of the session energized and looking forward to the rest of the day. Next came the Robot Inspection, in which Stacy (our robot) was verified and given approval to compete. We also had the chance to talk to a rookie FTC team called the Squidbots. One of the girls on the team had visited our branding presentation at the FTC Workshop, so it was nice to talk to her again and meet the rest of the team. Then came a Practice Round, Driver’s Meeting, and finally, the start of the competitive matches that would take the rest of the day. Every team has 5 matches before the elimination rounds to determine the tournament champion. Most of our matches resulted in Stacy’s connection failing, causing her to either start dancing or fall asleep on the game field. Despite these inconsistencies, we had a great time working together with other teams and cheering on our friends. We ended the qualification matches at about the middle ranking among the 20 teams. After these matches came alliance selection, in which the top 4 teams become “alliance captains” and choose two other teams to join them on their quest. The Knights of the Octagonal Table invited us and the Motorbolts (wohoo!) to join their alliance. We ended up in third place, which we were happy with, considering the technology problems that everyone was having. Minnesota Senator Al Franken, who was visiting the tournament, spoke about the impact of FIRST. While we waited for the last match, the DJ started hyping up the audience – Amy and Amelie started a YMCA dance and we all joined in on the Macerena and Cha Cha slide. After a very loud and exciting final match, a table was brought out and filled with trophies. 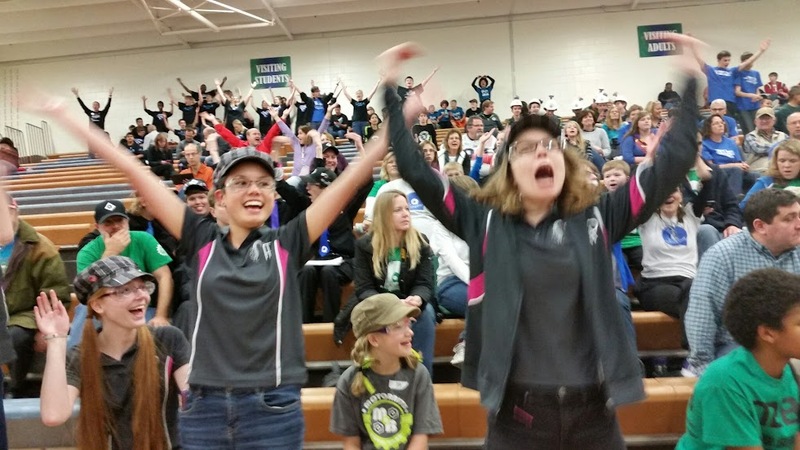 The awards ceremony began with more cheering and an audience of tired but enthusiastic teams. After the ceremony, our hands were sore from clapping – several of our friends won awards, including the Motorbolts (Rockwell Collins Innovate Award) and EPIC (Finalist Alliance). We were also very proud of the Rubies, who won the Connect Award for their work with FLL in Minneapolis schools. The Rubies have been around in FLL for several years and we were thrilled to see them win the award in their first year of FTC. All of Amy and Amelie’s hard work paid off when our name was called for the Promote Award (for a PSA video we submitted). Finally, the top teams of the competition were announced. Third place went to the Motorbolts, who we gave a standing ovation. Second place was Q is Silqent, an older team that we have admired since we joined last year. Then, finally, first place was announced. We couldn’t believe it. The judge called our name for first place, announcing that we had won the Inspire Award. We went through the volunteer high-five line with massive smiles, which only grew when we turned around and saw the Motorbolts forming another mini high-five line for us. 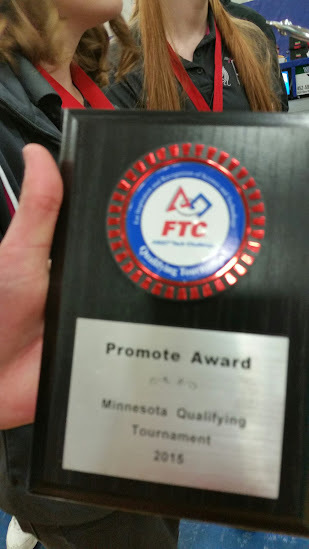 Along with winning the Inspire Award, we qualified for the State Tournament in February. 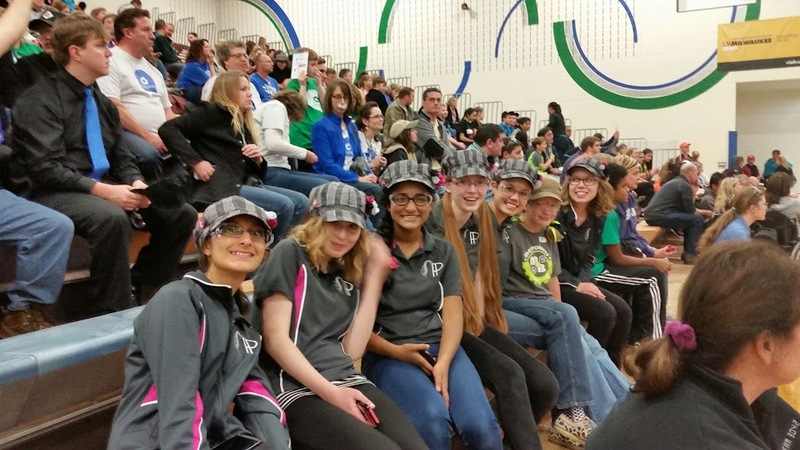 We couldn’t have been happier – qualifying for State at our first tournament means that we can take risks and learn more for our second in January. As a result of this qualifier, we are super excited for State and can’t wait to see what else the RES-Q season has in store. Thank you so much to High Tech Kids and Sunburst Robotics for hosting the Eagan Qualifier! We had a blast! We are soooo proud of you girls. You did a fantastic job and we loved coming to see what you were doing. What a bright future all of you have! Congrats! We got a real “charge” out of Stacy. Thank you so much! You guys are so sweet and such a great inspiration to us for what we hope to achieve in the future! Your ability to engineer solutions, work together, perseverance and excellent teamwork is an inspiration for this ‘old engineer’. Great work. Keep it up. We need more folks like you in engineering.